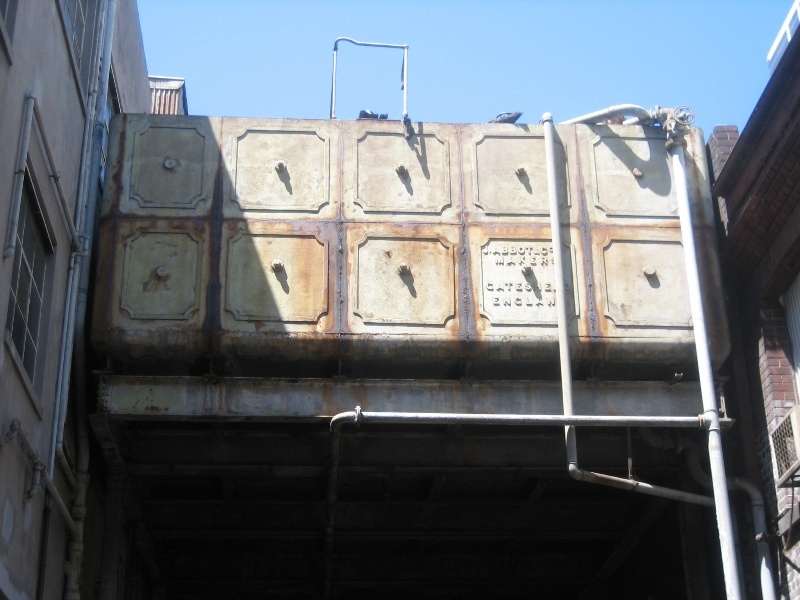 The Overhead Water Tank at the Former Spencer Street Power Station is a prefabricated cast iron water tank which was one of two originally built in 1889 by J. Abbot and Co,. Gateshead England for the Hydraulic Power No1 Pumping Station. The pumping station was located adjacent to the Australian Wharf (North Wharf) on the Flinders Street Extension on the north bank of the Yarra River in Melbourne. 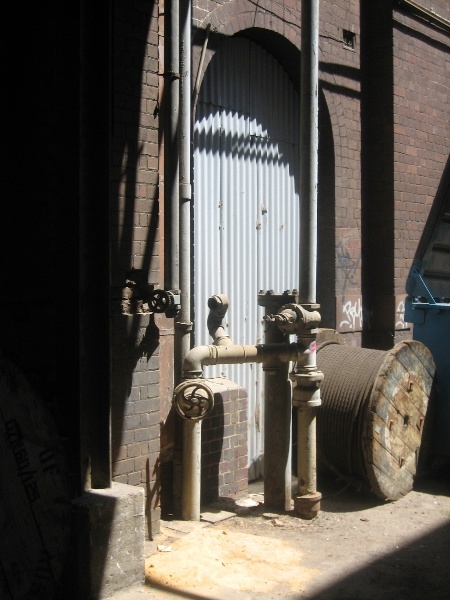 The water tank was moved from the No1 Pumping Station and re-erected, albeit with reduced capacity, in its present location in 1927 as part of Melbourne City Council's consolidation of the city's hydraulic power supply at the Spencer Street power station. In its original form it had a capacity of 115, 000 gallons but this was reduced to 58, 000 gallons to suit the requirement of its new use and location. 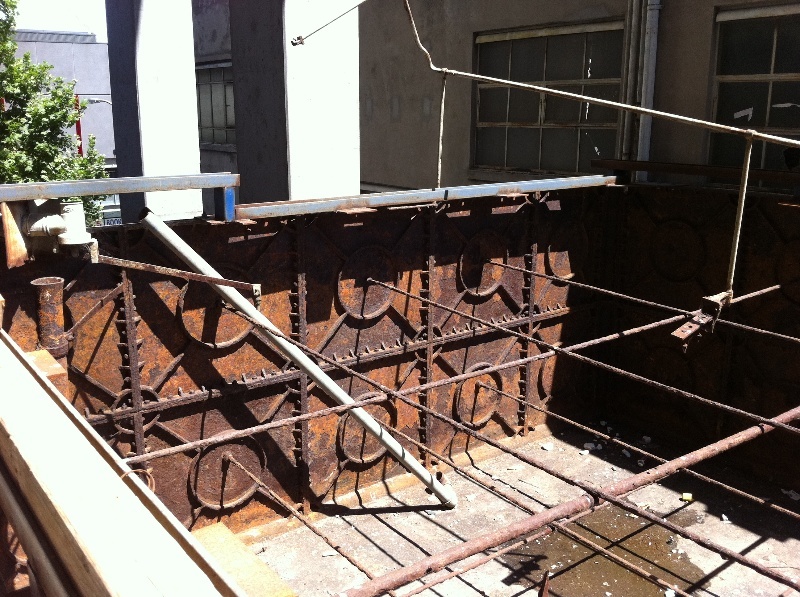 The tank is constructed of prefabricated cast iron panels connected via series tie rods and is supported over a laneway on a steel framed structure. The tank is fourteen panels long (16.916 m) by 5 panels wide (6.1m). The side of the tank are two panels high and it is divided internally into three roughly equal compartments. A number of pipes and valves associated with the function of the tank are extant as are a number of valve covers at ground level which are associated with the supply of water and the distribution of high pressure water. 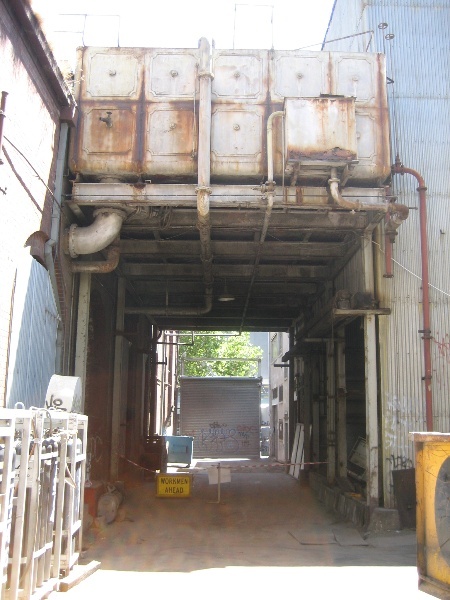 The hydraulic power system which this tank serviced provided high pressure water for operating lifts and cranes in Melbourne's CBD, South Melbourne and Kensington. Melbourne was the first of only two cities outside England to build a public hydraulic power system. Sydney was the second. 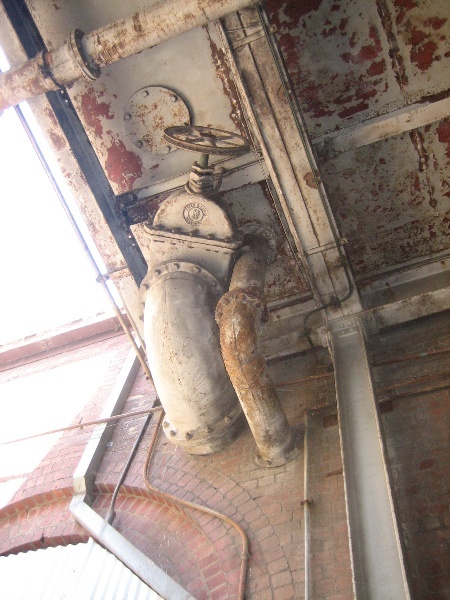 Of the two tanks at the No1 Pumping Works, the larger of the tanks received water via gravity from Dight's Falls and in turn supplied a regulated flow to a smaller tank that a provided positive head of water to the pumping engines. 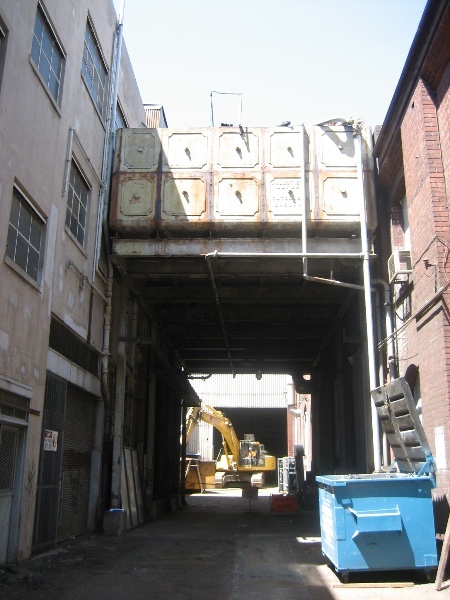 It was the larger of the two tanks that was moved to Spencer Street and was used to provide a gravity intake the two Thompson high pressure pumps. Declining use of hydraulic power meant that the hydraulic power service ceased operation on 31 December 1967. 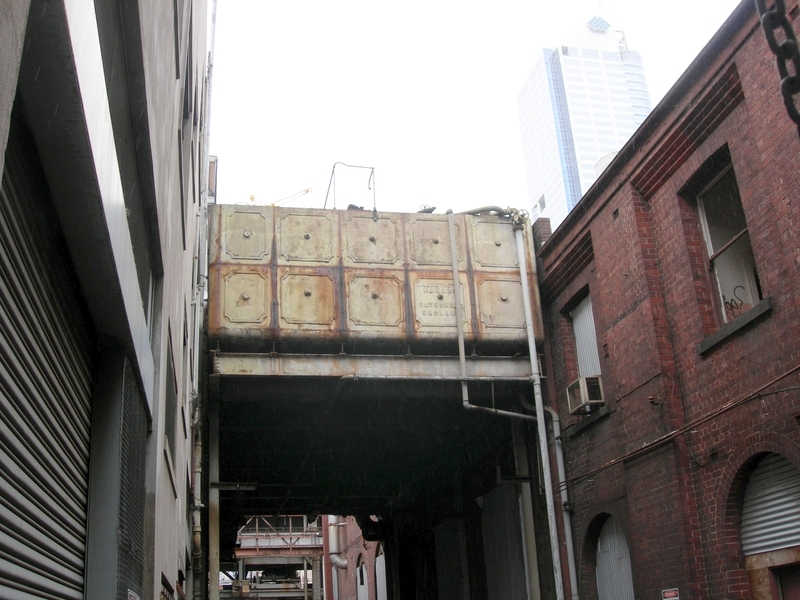 The overhead water tank at the former Spencer Street Power Station is of historical and scientific (technical) significance to the State of Victoria. 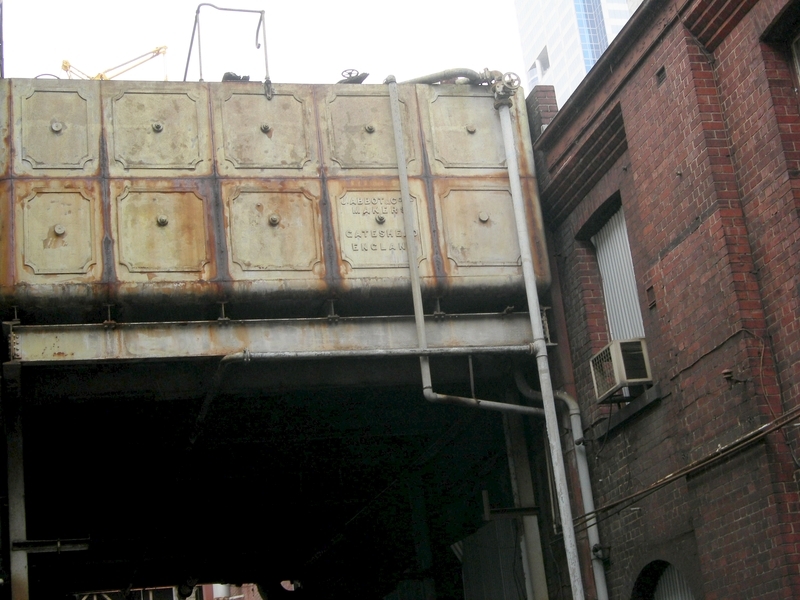 The overhead water tank at the former Spencer Street Power Station is of historical significance as the only major surviving element of the system that was used to generate and supply hydraulic power to the city of Melbourne from 1889 to 1967. 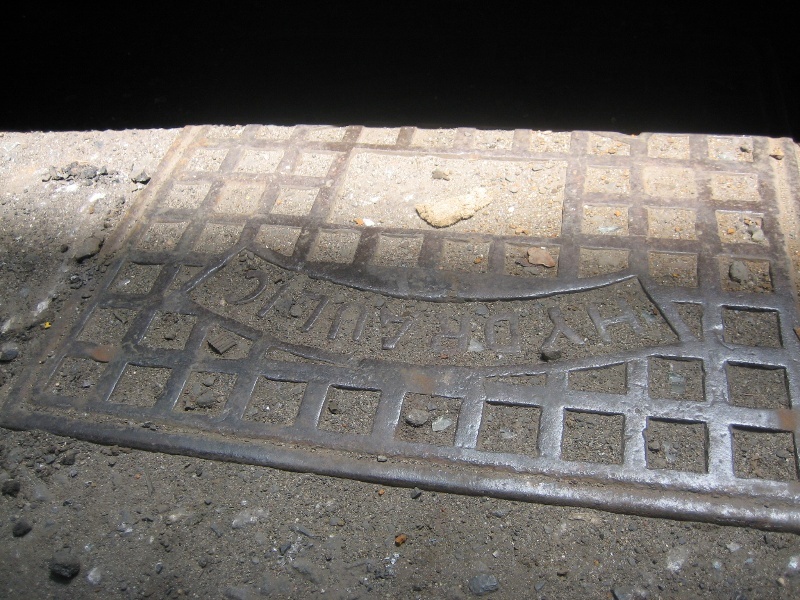 The tank is also significant as the only known surviving element of the original Hydraulic Power Company No.1 Pumping Station. 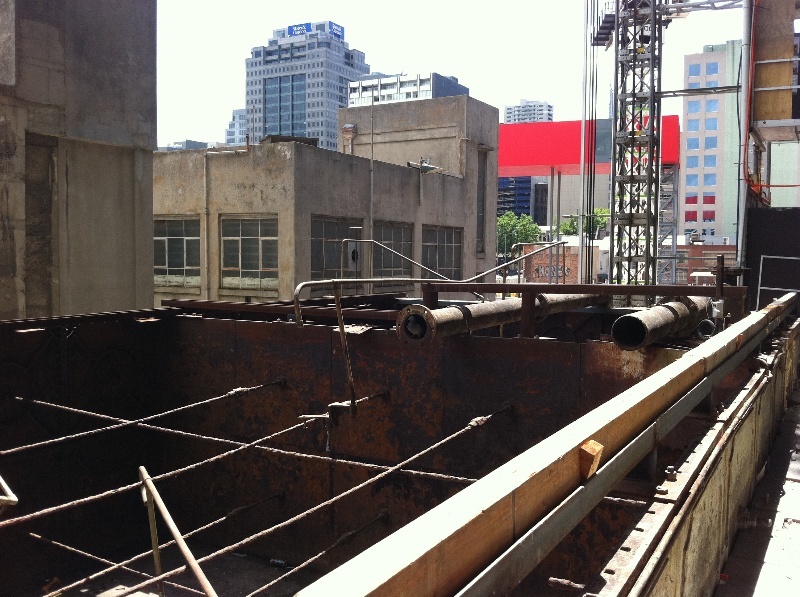 1.All of the structure shown as B1 on Diagram 2117 held by the Executive Director known as The Overhead Water Tank at the Former Spencer Street Power Station including all associated pipework, supporting structures and metal valve cover plates on the ground adjacent the tank. 2. All of the land shown L1 on Diagram 2117 held by the Executive Director being part of the land described in Certificate of Title Volume 10372 Folio 666. The purpose of the Permit Policy is as a guide in assisting when considering or making decisions regarding works to the place. 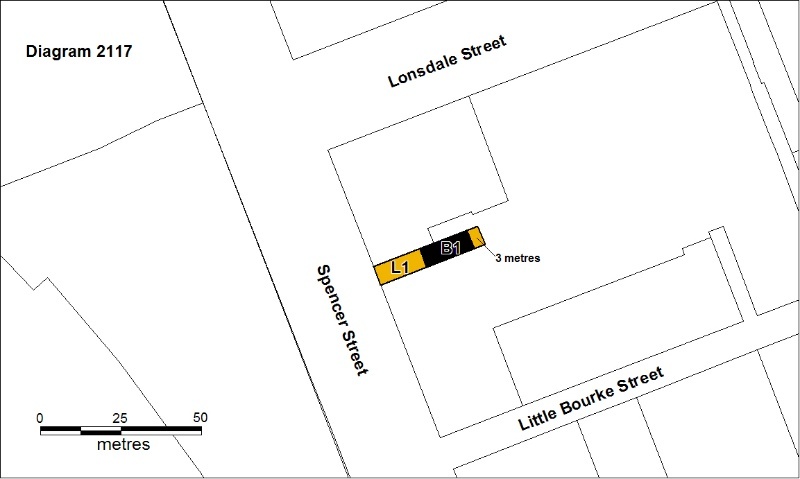 It is recommended that any proposed works be discussed with an officer of Heritage Victoria prior to them being undertaken or a permit is applied for. Discussing any proposed works will assist in answering any questions the owner may have and aid any decisions regarding works to the place. The significance of the structure lies in being a rare remaining example of its type. Any proposal to alter its size or form should be avoided. 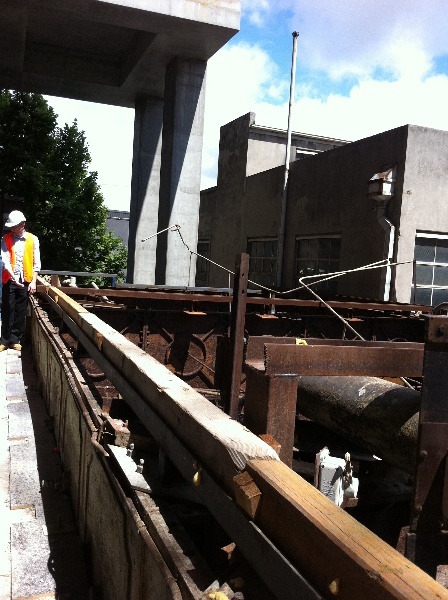 It possible that the tank and its associated fabric could be relocated. However the structure and all of its associated fabric would require full photographic and measured recording to the satisfaction of The Executive Director of Heritage Victoria in situ prior to any removal.